Restless and Ready to Ramble! 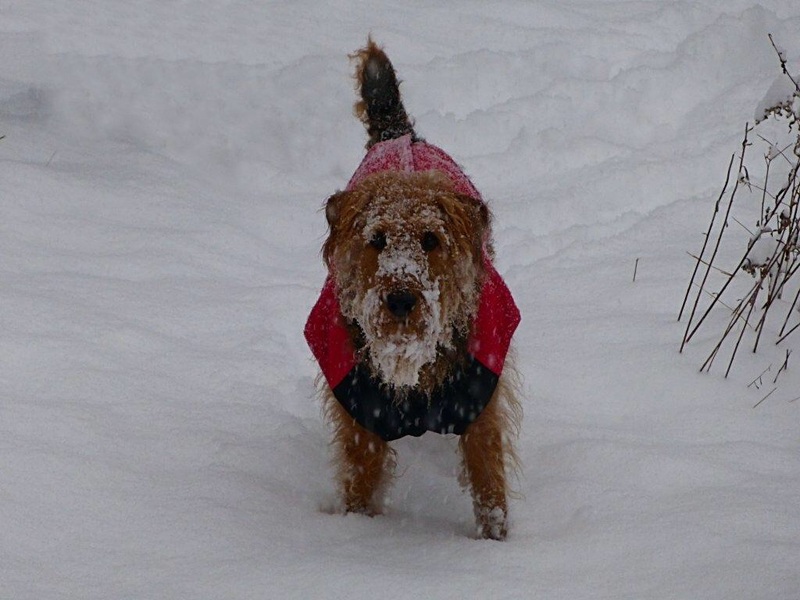 Woolly Bear enjoying the snow. I haven’t written in ages because there was no travel going on. 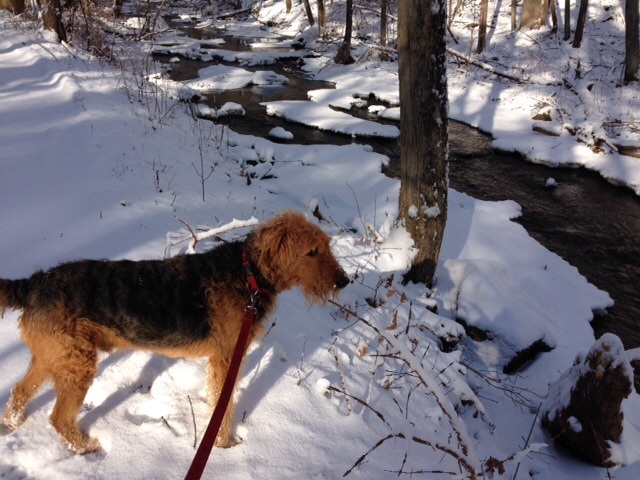 Our Airedale Terrier took much longer to recover from his ruptured ACL than anticipated, then managed to partially tear his “good” ACL and had to have a second surgery the end of August. The total recovery time is about six months, and we are fast approaching this! So, plans are in the works for a March journey and then a May resumption of our trip to Alaska. We have made some changes while waiting for Woolly Bear to rehab. One change is in the RV itself. We purchased a less expensive RV than the Winnebago View. Instead of being a Mercedes Sprinter chassis, it is a Ford Chassis and a gasoline fueled Ford engine. While the Sprinter was a very nice vehicle, the uncertainty of the DEF warning light coming on at unexplained and unexpected moments, coupled with the run around we got every time there was a mechanical problem, led us to a much less fancy, but easier to maintain, Ford. An example of what I am talking about took place when we were camped at Mather Campgound in the Grand Canyon National Park. Charlie noticed a problem with the air filter and we started looking for a repair shop. The garage at the Grand Canyon was not equipped to repair a Sprinter. We called the nearest Mercedes Service shop, and they said we would have to call Dodge(!?!). We called the Dodge Service shop, and they asked for the VIN number, then after leaving us on hold with iffy cell service for what seemed like eternity, came back and said that they were not allowed to work on our vehicle, we needed a Mercedes or Freightliner to work on it. Fortunately Charlie was able to drive it safely to Flagstaff, purchase the part needed at an O’Rourke’s and perform the repair in the parking lot himself. This scenario of ” sorry, can’t work on that vehicle” repeated itself a few more times, with us finding that some Freightliner shops would, or would not, touch the vehicle. I may be wrong, but I expect many less head aches getting parts and repairs for a good ol’ Ford truck. Our new RV is a Winnebago Vista and is 26 ft long, 2 feet longer and a bit wider than the View was. It is considered a class A, and therefore does not have the narrow van nose with doors. While we will miss the smaller profile, I am delighted that the new RV has a 3 burner stove and an oven!!! We do all of our own cooking and I have missed the ability to bake or roast. We also have a dinette instead of the small couch the View had, automatic levelers so that I will no longer have to crawl around in the rain and mud putting wooden planks under the tires to level it ( I especially will not miss doing this when we are in rattlesnake country), and much more storage space. Of course, the View was much more economical to drive as it got 15 mpg and the new RV is supposed to get 10mpg ( that remains to be seen), but we are planning on that trade off. Another change is that we will tow a car this time. On our three month tour last spring we were limited in where we could explore. In Big Bend and in Moab there were many dirt roads and scenic byways we had to skip because the View was just not nimble enough to maneuver the roads. And on windy days when it was not safe to drive the View, we were stuck in camp. Now we will be flat towing a Jeep Wrangler Unlimited, and our mountain bikes fit into the back compartment of the RV. It will be really nice to have two additional forms of transportation. The only reservations I have made thus far are for Denali campgrounds: Rielly Creek and Teklanika in July. Right now we are waiting to get our tow car set up with brakes, lights, etc. then we need to be able to get the RV off of our frozen hill, and we will return to the open road. 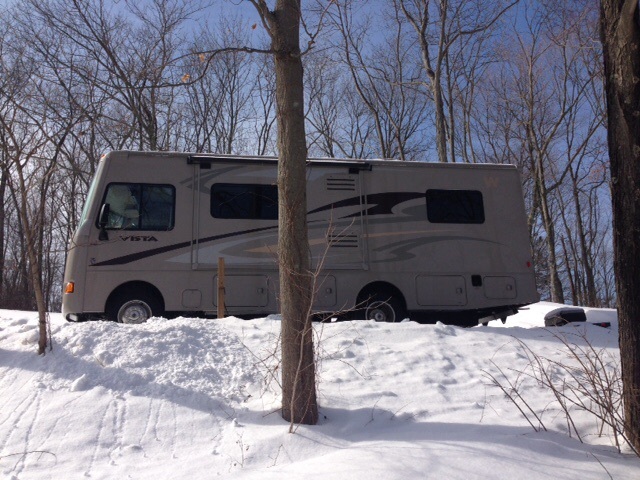 This entry was posted in Rving on February 17, 2015 by Ramblin' Rose. Have a wonderful trip to Alaska! The only reservations we made ahead of time were for Teklanika in Denali NP and in Jasper and Banff. You will love it! And with your size rig you will not have any trouble finding a place to camp. We took your advice and have made Jasper and Banff reservations! Can’t wait to be on the road again. We’ve been enjoying your Texas trip reports.